The Connacht centre remains uncapped, but already feels his reaction time and decision-making improved in Carton House. 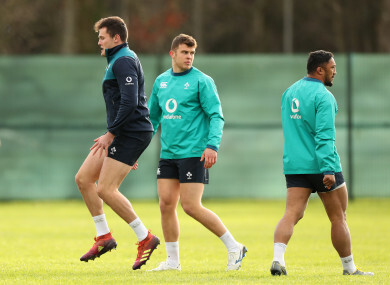 Farrell, centre, with Jacob Stockdale and Bundee Aki at Ireland training last month. CONNACHT CENTRE TOM Farrell says his time in the Ireland camp during the Six Nations has made him an even better player. The 25-year-old admits he was disappointed not to earn his first Ireland cap over the competition, but he still has ambitions of cementing his place in Joe Schmidt’s squad before the World Cup later this year. The former Leinster underage player has been the star of Connacht’s midfield this season and his six tries from 12 starts have been a big reason behind Connacht being in the hunt for the play-offs. He is also Connacht’s top ball-carrying back in the PRO14 (135) and the league’s leading offloader (26), but he is hopeful of adding to his success in the remaining four league games after a learning experience with Ireland. “It was brilliant. It was probably an eye-opener as to the standard that’s required. “I went up there and I knew it was going to be a step up but I probably didn’t realise the size of the step up, the speed of things and the intensity of it all,” said Farrell, who joined Connacht from Bedford Blues two years ago. It’s definitely improved me. The speed of my reaction time, my decision-making under pressure. Coming back to Connacht, it’s not a massive step down, but I feel that I have that bit more time on the ball now. Farrell was not in Cardiff to experience the anguish of Ireland’s loss to Wales, and instead he returned to Connacht on the day the Ireland squad flew out of Dublin. He was straight back to training with Connacht on Friday. And while the loss to England was hard to stomach for all of the squad, Farrell thinks they coped well with the setbacks. “I didn’t know what it was like previously because I am quite new to the whole thing. I wouldn’t have said the wheels fell off the wagon or anything at all like that. The first loss was put to bed and we moved on pretty quickly. On Friday, Connacht host Benetton Rugby at the Sportsground, where a win could see them pull clear of Conference A’s joint third-placed Cardiff Blues, who face a tricky Welsh derby with Scarlets. Farrell feels it’s all to play for. “But it’s great to be back in Connacht. This time last year we were that bit further down the ladder, which made it quite difficult for ourselves. Email “Tom Farrell senses noticeable improvement after Ireland camp”. Feedback on “Tom Farrell senses noticeable improvement after Ireland camp”.